Via Bangkok (Ferry, bus and plane): Take a ferry and then a bus from Koh Chang back to Bangkok (6 to 10 hours) and fly from Bangkok to Siem Reap (1 hour). Via Aranyaprathet (Ferry and bus): This route involves taking a ferry from Koh Chang to the Thai mainland, then travelling northward to the border with Cambodia near Aranyaprathet, crossing over to Poipet in Cambodia and then taking another bus or taxi onto Siem Reap. Expect to complete the journey in around 9 to 10 hours, which is likely to be quicker than travelling back to Bangkok and flying from there, as well as about a third of the cost. 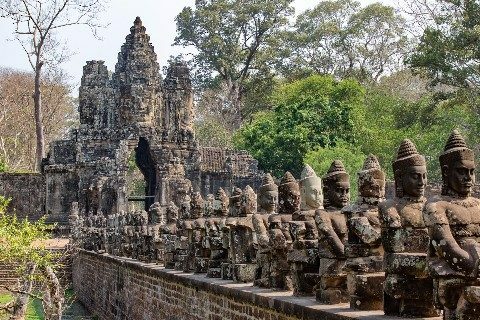 Jolly Travel operates a single daily direct departure from Koh Chang to Siem Reap including the cost of the ferry, the bus service to the border with Cambodia, and then the bus to Siem Reap. The Jolly Travel service includes a minivan transfer from your hotel in Koh Chang to Koh Chang Pier to start the journey to Siem Reap. Use the Search Box below to book your tickets from Koh Chang to Siem Reap. Secure Online payment by card or through PayPal. Instant Ticket confirmation by e-mail. The total distance covered from Koh Chang to Siem Reap, via the border crossing at Aranyaprathet, is slightly over 400 km. Foreign visitors to Thailand are required to take this long route as they are not currently permitted to travel from Thailand into Cambodia via border crossing closer to Koh Chang which allows travellers to take a more direct route by road. This may change in the future but for the moment if you are not a Thai or Cambodian national then your closest crossing point is the border at Aranyaprathet. The Jolly Travel travel service from Koh Chang to Siem Reap is a journey of five parts. Stage 1: 07.00 pick up from your hotel in Koh Chang to the ferry pier. Stage 2: 08.30 ferry from Koh Chang (45 minute journey). Stage 3: Mainland ferry pier to Aranyaprathet border crossing (3 hr 20 minute by bus). Stage 4: Pass through immigration into Cambodia on foot. The total time spent in a moving vehicle or ferry is around 7 hours. The other 2 hours of the scheduled journey are taken up waiting for the ferry or the various bus services, and for all passengers using their service to clear Thai and Cambodian border control. Some patience is required from travellers who make this journey. Bring a book to read. The Jolly Travel service from Koh Chang to Siem Reap terminates on the roadside on Street 27 in Siem Reap near the Love U Restaurant. The Street 27 drop off point is on the east side of the Siem Reap River and a 1.1 km walk or taxi journey away from the busy Siem Reap Night Market area.